María Sabina Magdalena García was a Mazateca “curandera” (native shaman) who became an icon of “pop culture” in the late 1960’s. From childhood she was raised to heal the sick through a ceremony called the velada. This involved consuming mushrooms in order to open the gates of the mind, purify the soul and commune with the sacred. The eminent ethno-mycologist Gordon Wasson traveled to a remote region of Oaxaca in 1955 to learn about the mushrooms and to participate in the velada ceremonies. In May1957, Life magazine published his article “Seeking The Magic Mushroom”. Ultimately this innocent piece of journalism altered María Sabina’s life and the culture of the local Mexican people. By 1967 the Oaxacan region surrounding Huautla de Jiménez, where María Sabina resided, was inundated with foreigners who rented cabins in hope of meeting the curandera. It is rumored that among the “truth seekers” were several rock stars including Bob Dylan, John Lennon, Mick Jagger and Keith Richards. One must remember that in the late 1960’s the paparazzi were not as all-pervasive as they have become in recent years and cell phones with digital camera did not exist. In today’s world, governed by technology, had these stars been spotted with the curandera, videos would instantly appear on YouTube. Unfortunately, as no such photos have surfaced, one can only speculate as to the legitimacy of these claims. Regardless of whether or not María Sabina actually ministered to various rock stars, the word was out that this was a psychedelic haven. By the early 1970’s the area was overwhelmed with counter-culture youth from around the globe expecting to experience hallucinations induced by magic mushrooms. Hippies and academics alike were flooding into the region. No matter if they were seeking a unique “high” or doing research for a thesis, they could not see the harm they were doing by invading this small traditional community. These visitors exhausted Maria Sabina both economically and physically. One of her heirs remarked later that the Rolling Stones or one of her other wealthy visitors might at least have bought her a washing machine, since they expected her to do their laundry in addition to performing rituals. Not having been farther from her village than she could walk, Sabina was naive about western culture and initially very hospitable to those seeking her expertise. In the tradition of a curandera María Sabina would not consider turning away anyone asking her to perform the ritual. Many of her followers brought gifts and she may or may not have received money for her troubles but she did not become a wealthy woman. Never the less, several local farmers discovered that they could earn significantly more by taking these hippies on mushroom seeking excursions than by working the soil. This created social problems in the traditional agrarian community. Resentment continued to grow as local young people were becoming corrupted by these visitors who lacked manners, respect and traditional morals. With so many hippies coming to the region María Sabina began to attract the attention of the Mexican police, who were pressured by authorities in the United States to crack down on drug users. She was harassed and questioned by the police. The Mexican State was forced to prosecute anyone who assisted foreigners in finding or consuming magic mushrooms or other such substances. Eventually the community turned against María Sabina and her simple three-room adobe house was burned to the ground. 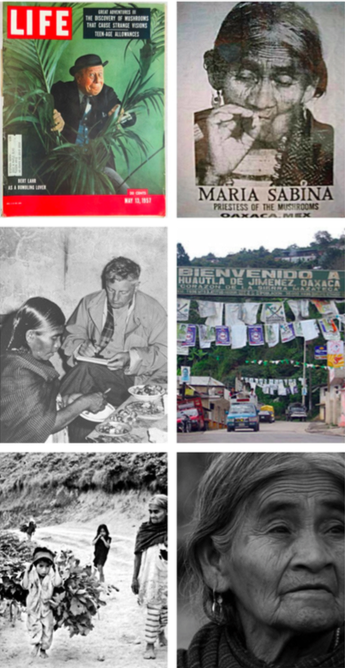 There is a renowned image of María Sabina printed on everything from taxis to t-shirts. It is assumed that she is smoking a huge joint of marijuana, making it an iconic image for the drug-using counter culture. Nothing could be farther from the truth… she was smoking a cigar, a common practice among indigenous women in the 1950’s. The photo portrays her as rebel; the reality is she was a very simple, kind, conventional woman caught up in a social turmoil she knew nothing about. Just like the conquistadores who tried to destroy the indigenous gods and ceremonies, the “search for enlightenment” among the hippie generation and the backlash it caused drove the velada ceremonies underground. It may still exist but you are unlikely to find someone willing to invite you to experience it. an ocean view bed and breakfast in Huatulco.